Every year, the office has a big holiday feast where everyone is expected to bring in food based on the list to which they are assigned. The lists include dessert, side dishes, and salad. For the last three years, I have been relegated to the salad list. I enjoy cooking – baking in general – and make some really fabulous deserts in particular. However, due to societal prejudices, no one believes that someone like me (geek) can make edible food that doesn’t come from a bag or box. Hence, the perennial salad list. 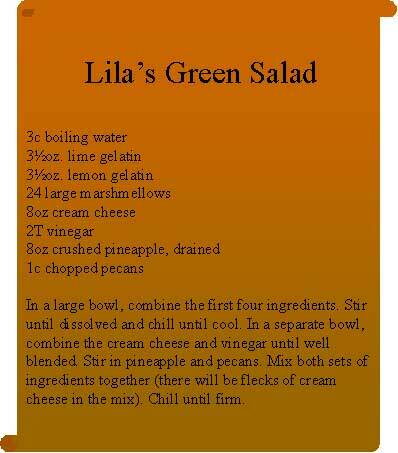 So this year, at the suggestion of my lovely wife, I whipped up a green salad that is guaranteed to get me off of the salad list. It’s a Jello/marshmellow concotion that tastes just fine but looks quite vile. Them: So, what did you bring? Me: The green and white looking thing in the bowl? Them: (forced smile) Oh that. I had some of that. It was really good. If everyone who claimed to have eaten some of my creation had tried even a smidgen, the bowl would have been scraped clean. Ironically, the leftover food (including mine) was left in the refrigerator for lunch the next day, where mine was consumed by default. Once people get past the appearance, it isn’t all that bad. But it should keep me off of the salad list next year. For anyone with similar problems, the recipe is listed to the right.